9 sizes of Dividable Grid Containers, Dividable grid totes, Divivable Grid Container, Riverside Paper Co.
MUST ORDER IN CASE QUANTITIES ONLY, PRICING IS PER EACH TOTE, DIVIDERS OR COVER. 10-7/8 x 8-1/4 x 3-1/2" Heavy duty Dividable Grid Container can be used in industrial, commercial, electronic, and health care industries for storage, assembly, fabrication and distribution applications. These containers offer the safest and most efficient method for compartmentalization and protecting small to medium sized parts. Available in 4 different colors: Blue, Gray and Red. 10-7/8 x 8-1/4 x 5" Heavy duty Dividable Grid Container can be used in industrial, commercial, electronic, and health care industries for storage, assembly, fabrication and distribution applications. 16-1/2 x 10-7/8 x 3-1/2" Heavy duty Dividable Grid Container can be used in industrial, commercial, electronic, and health care industries for storage, assembly, fabrication and distribution applications. 16-1/2 x 10-7/8 x 6" Heavy duty Dividable Grid Container can be used in industrial, commercial, electronic, and health care industries for storage, assembly, fabrication and distribution applications. 16-1/2 x 10-7/8 x 8" Heavy duty Dividable Grid Container can be used in industrial, commercial, electronic, and health care industries for storage, assembly, fabrication and distribution applications. 22-1/2 x 17-1/2 x 3" Heavy duty Dividable Grid Container can be used in industrial, commercial, electronic, and health care industries for storage, assembly, fabrication and distribution applications. 22-1/2 x 17-1/2 x 6" Heavy duty Dividable Grid Container can be used in industrial, commercial, electronic, and health care industries for storage, assembly, fabrication and distribution applications. 22-1/2 x 17-1/2 x 8" Heavy duty Dividable Grid Container can be used in industrial, commercial, electronic, and health care industries for storage, assembly, fabrication and distribution applications. 22-1/2 x 17-1/2 x 12" Heavy duty Dividable Grid Container can be used in industrial, commercial, electronic, and health care industries for storage, assembly, fabrication and distribution applications. 9-3/4 x 3 x 1/4" Long divider divides the area of Dividable Grid Containers into orderly compartments. Can be used in industrial, commercial, electronic and health care industries. Applicable to the DG91035 grid container. 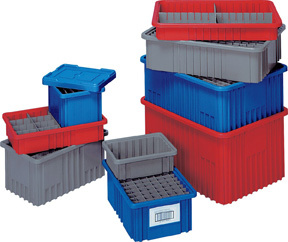 9-3/4 x 4-1/2 x 1/4" Long divider divides the area of Dividable Grid Containers into orderly compartments. Applicable to the DG91050 grid container. Long divider divides the area of Dividable Grid Containers into orderly compartments. Applicable to the DG92035 grid container. 15-1/4 x 3 x 1/4" Long divider divides the area of Dividable Grid Containers into orderly compartments. Applicable to the DG92060 grid container. 15-1/4 x 5-1/2 x 1/4"
15-1/4 x 7-1/2 x 1/4" Long divider divides the area of Dividable Grid Containers into orderly compartments. Applicable to the DG92080 grid container. 15-1/4 x 7-1/2 x 1/4"
20-3/4 x 2-1/2 x 1/4" Long divider divides the area of Dividable Grid Containers into orderly compartments. Applicable to the DG93030 grid container. 20-3/4 x 2-1/2 x 1/4"